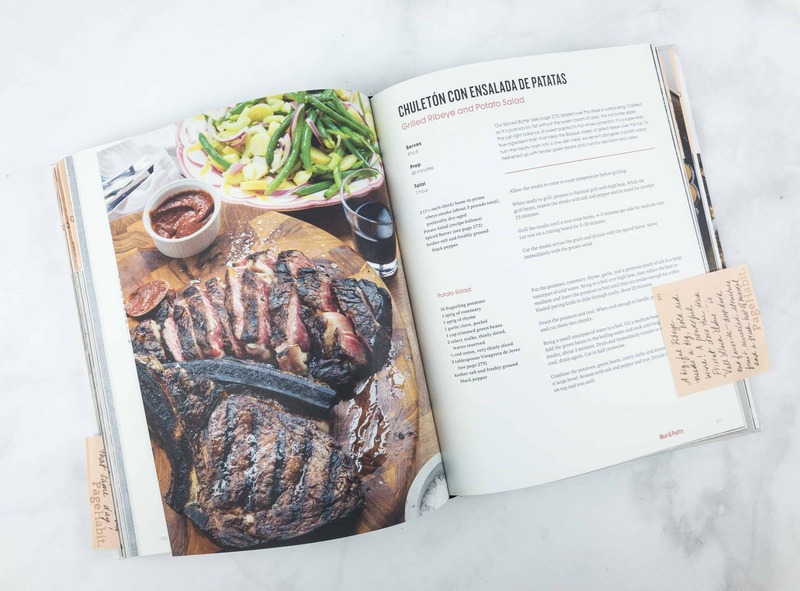 PageHabit Cookbook is a quarterly subscription from PageHabit that delivers a new hardcover cookbook for every season, annotated and curated by an acclaimed chef or author. Every package also includes selected kitchen tools and ingredients. The contents of the box are protected with so many squiggles! This is the Summer 2018 review! La Boqueria is Barcelona’s most famous and picturesque market. The card introduces us to Montados as well, which are flavorful toppings usually put on top of baguettes. Don Bocarte Bonito Del Norte ($21.32) Unlike other canned tunas which are salty, this tastes fresh and really delicious. Don Bocarte has the luxury of a wonderful natural resource in the Bay of Biscay, where some of the tastiest tuna in the world are found. This juicy fillet consists of the following ingredients: white tuna, olive oil, and salt. It’s incredibly tender at first bite, which is followed by an addictive aftertaste. Losada Whole Gordal Olives ($18.95) Gordal olives are large, oval-shaped olives grown in Spain and other countries such as the U.S. They’re green in color and have a rougher and meatier texture. These bottled olives are light in salt so the true olive flavor comes through. 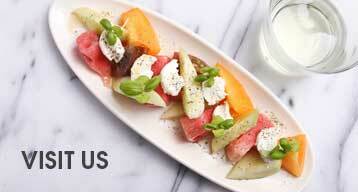 You can enjoy them on fresh green salads, addition to cocktails, or even as tapas (appetizer)! Dantza Pimiento Del Piquillo De Lodosa ($6.95) These fire-roasted piquillo sweet peppers are great additions to paella or other Spanish dishes. You can even serve them as tapas. This tin contains about 8 whole peppers. Palacios Chorizo Dulce ($11.50) This sausage contains pork, paprika, salt, and garlic. It’s also all natural. No preservatives, no artificial colors. You can add this to paella and jambalaya, or served it on a party platter. It also tastes great when paired with cheese! The authors of this book have lots of annotations inside! 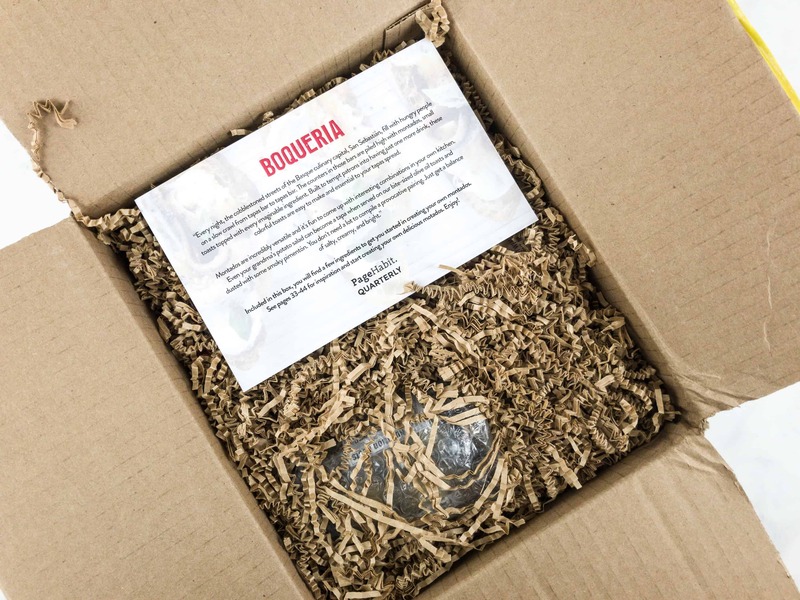 For over a decade New York City’s famed Boqueria restaurants have been distilling the energy, atmosphere, and flavors of Barcelona, becoming a place where patrons share excellent wine and exquisite dishes. From traditional tapas like crispy patatas bravas and bacon-wrapped dates to classic favorites like garlicky sautéed shrimp, pork meatballs, and saffron-spiced seafood paella, Boqueria captures the very best of Spanish cuisine. 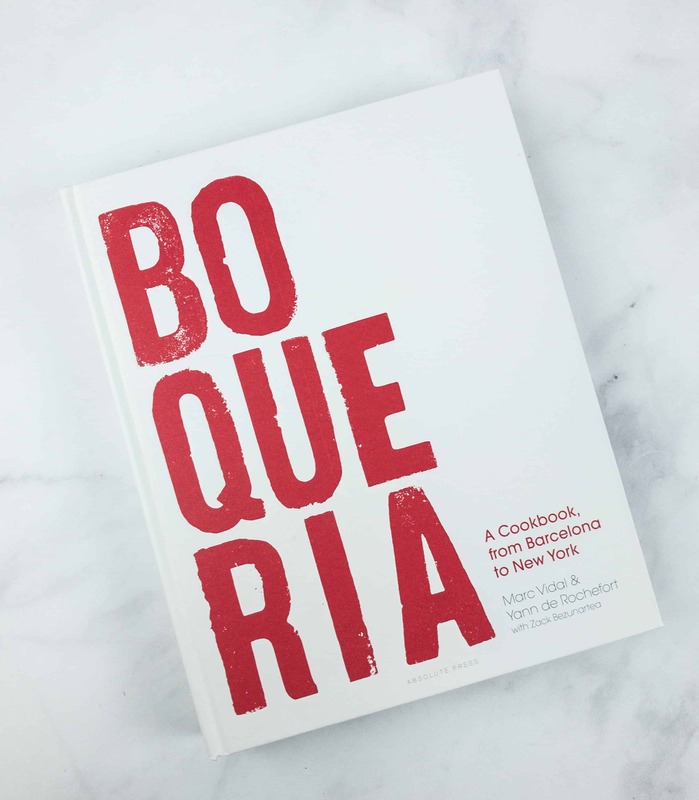 For this sumptuous cookbook, restaurateur Yann de Rochefort and Executive Chef Marc Vidal tell the story of Boqueria, which has now spread to four New York City locations as well as to Washington, D.C. While the recipes-all deeply rooted in Barcelona’s culinary culture-take center stage with phenomenal food photography, Boqueria also swings open the kitchen doors to reveal the bustling life of the restaurant, and offers exciting glimpses of the locales that inspired it: the bars, markets, and cervezerias of Barcelona. Transporting us to the busy, colorful stalls of the legendary fresh market “La Boqueria,” these portraits of the Spanish city are so vibrant that you can almost smell the Mediterranean’s salt air. 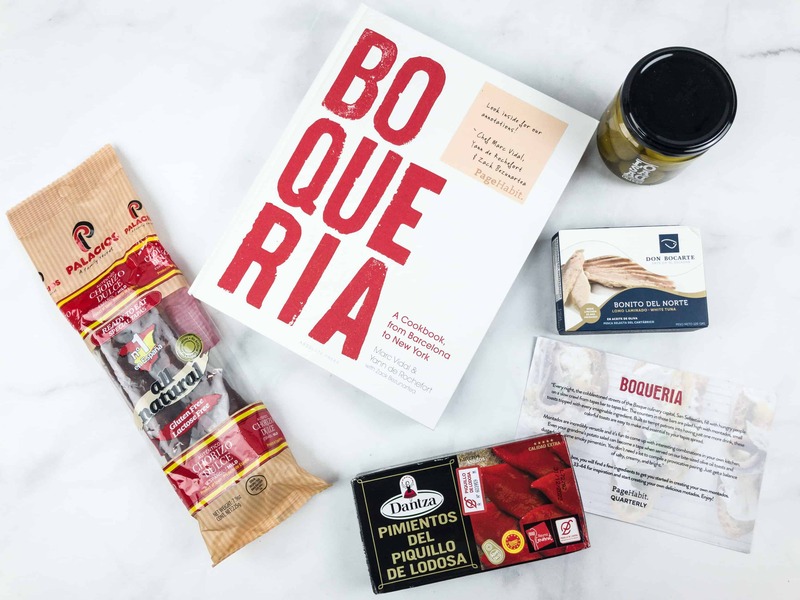 Boqueria’s recipes are delectable variations on authentic Barcelona fare, but more than that; along with their origin stories, these recipes inspire a bit of the Boqueria experience-the cooking, the conversations, and the connections in your own home. 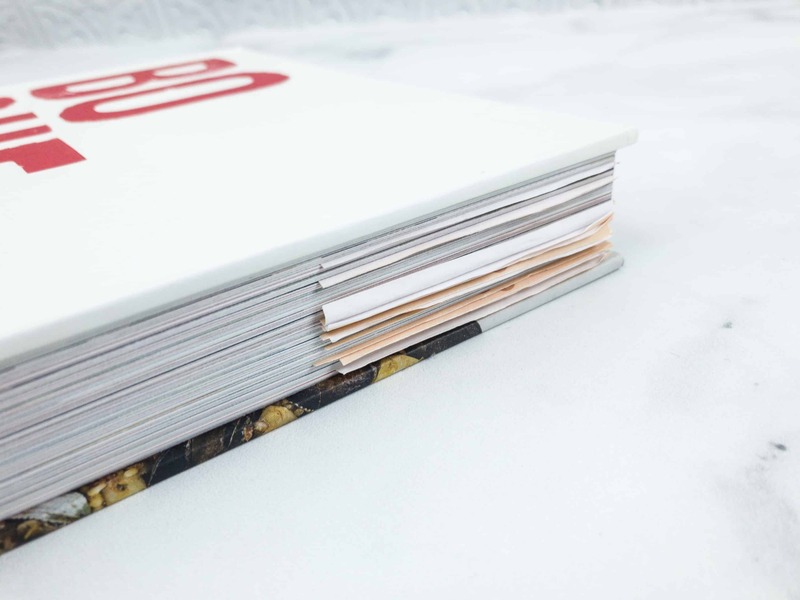 I can see lots of notes sticking out of the cookbook’s pages! This one here says that you should order real Padron peppers from Viridian farms in Seattle. They pick the pepper in the morning and have them shipped to you on the same day! I like this recipe called Pimientos de Padron, which are blistered green peppers with sea salt. The photo looks inviting! Indulging on ribeye steak? I completely agree with the author that it’s best paired with big, bold red wine! Here’s the recipe of grilled ribeye, plus its perfect side, the potato salad! Since we got a canned tuna and pimientos, we can easily whip up a Montados de Atun with the help of this recipe! Spanish dishes are really interesting! When it comes to specialties, Spain has a lot to offer, from appetizers to mains! Most ingredients can also be tapas, not just an addition to the main dishes. I love how recipes are made easy in the cookbook. The annotations are really helpful too. Most of all, I love how most Spanish dishes go really well with wine! PageHabit Cookbook edition is a treat for any household or any person who loves to cook and explore new cuisines. The inclusion of the notes also adds excitement to the process since they come straight from the author. I can’t wait to try them out!